Head out to your campground of choice with this Jay Feather 7 travel trailer 19BH by Jayco. 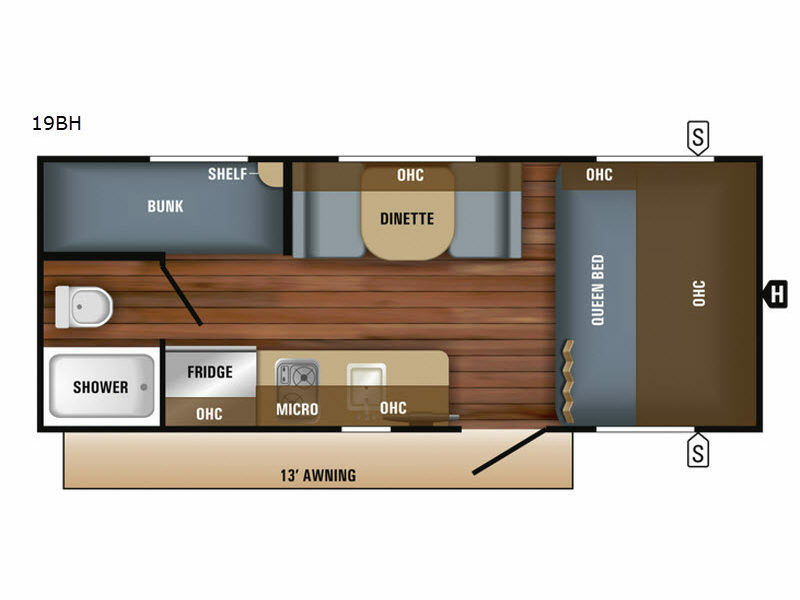 Inside you will find a Jayco-exclusive queen Simmons mattress in the front, and in the rear there are Teddy Bear “soft-touch” bunk mats on the bunk beds. Easily prepare your meals in this kitchen while you are away from home. Here you will find a refrigerator, sink, microwave, and a two burner range. 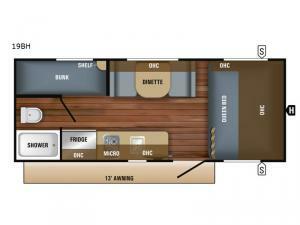 Outside there are large front storage compartments under the queen bed. Here you can store all of your exterior camping gear. The 13’ awning provides plenty of shade during the day, and with the LED lights you can enjoy your evening out under the stars. When you are ready to soar into the camping world, come choose a Jayco Jay Feather 7 travel trailer. These travel trailers have a modern retro graphics package with two-colored sidewalls, as well as, a fresh new interior look. Outside you will find an aerodynamic, rounded front profile with a front diamond plate, a Norco NextGen frame with integrated A-frame, and TuffShell vacuum-bonded laminated floor, side, rear, and front walls which also include the slide out room walls. Inside you will enjoy conveniences such as a crown molding with wood batten strips on the ceiling, 4” high-density dinette cushions with vinyl backing, LED lighting throughout, as well as skylights which allow for so much natural lighting in the bathroom.